22 Jan Dental Implants – Why is the Brand Important? Dental implants have been in use since the 60s, at which time the implant therapy was still in its development stage. During this period, the field of oral implantology amassed a lot of priceless experience. These days we consider this type of therapy to be practically a routine one. Despite this, a significant number of people still aren’t acquainted with the details of implant therapy and so they may even hold a distorted or an entirely wrong perception of the treatment. Unsurprisingly, there are only a few companies in the world that started producing implants as early as the 60s and, thanks to that, today these companies are the leading implant manufacturers holding the greatest knowledge and experience in this field. With this important fact in mind, I would advise anyone who decided to proceed with this type of treatment to make sure they ask their dentist what kind of implants they use, because it is a relevant question to ask. In the same way that you take into account the brand of the car that you’re buying, since you’re well aware of the quality difference between Fiat and Mercedes for example, you should also consider the brand of implants. There are implants that are manufactured by the companies that, as I’ve already mentioned, are known to have considerable knowledge and experience in this field, however, there are also implant brands that haven’t been tested and are manufactured by companies that are only motivated by quick profit. Therefore, asking about the brand of implants used in your therapy is a very important thing to ask. 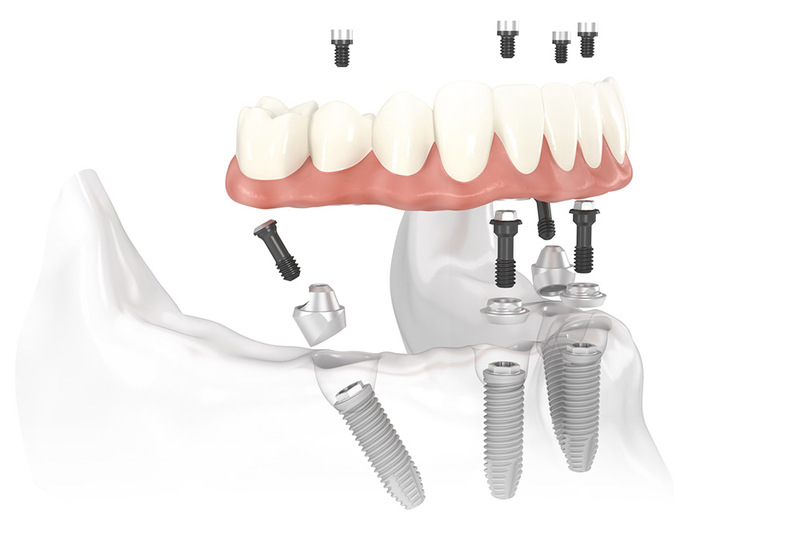 Smile studio prides itself with the certificates for the use of several implant systems. Within our offer we would like to draw attention to the implants with a life-long guarantee made by the most influential world manufacturer, Nobel Biocare, as well as the implants of Swedish companies AstraTech and AlphaBio along with the implants of the Spanish manufacturer BTI. 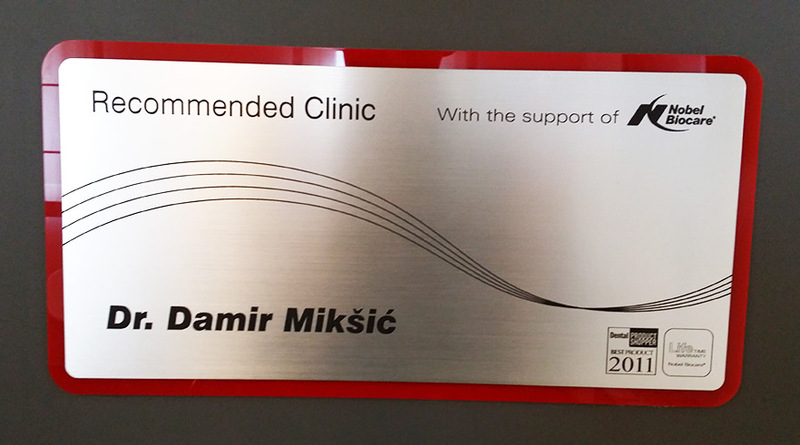 Nobel Biocare also awarded our clinic with the” Recommended clinic for Nobel Biocare implants” certificate. An implant is a bone fixture, made of special, high quality material (titanium) as well as a specifically manufactured surface that may be used to replace one or several missing teeth. In layman’s terms we may say it’s a ‘copy’ of the tooth root which is used for a prosthetic rehabilitation. Some people grasp this concept easily, however many find it complex to understand. Having participated in numerous educational congresses, one of our colleagues compared the implant with a term that is well known to us all and that is a screw and dowel system. Since we’ve all drilled walls at home, used the dowel and then put the screw in, this concept is familiar. The principle is fairly similar, but that is where all the similarities end. The procedure is far more complex and it demands the experience and expertise of the therapist, as well as the patient’s cooperation. The implant is made out of two parts. The first part (that we compared to a dowel) is placed into the bone where it remains undisturbed for a period of time. After a while, we place into it the second part (our so-called screw) that serves as a frame for the prosthetic solution (crown, bridge, prosthetic piece). The most frequent question that patients ask is how likely it is that implant integration will be successful. Some twenty or more years back, the success rate of implant therapy wasn’t nearly as high as it is today, and thanks to that ‘old’ information, the patients may have a negative attitude towards this kind of therapy. However, thanks to the development of various scientific disciplines, we gained insight into factors that affect the success rate of the implant therapy, so we can confidently say that any risk is made minimal. The success of this type of therapy depends on a number of factors starting with good planning of the implanting procedure, which includes the analysis of the CT scans that is used to assess whether the implant therapy can be carried out. The other factors are: the first appointment with the patient, the professionally preformed surgical procedure and, as I already mentioned, the brand of implant which is placed by the therapist. The procedure itself is completely painless since it’s being preformed under local anesthesia and the pain following the procedure is almost nonexistent unlike the uncomfortable pain felt after a tooth extraction. Many patients have an impression that this type of procedure is bound to last a very long time and they’re quite surprised when they find out that it usually takes less time than a ‘regular’ cavity treatment! After the implantation procedure there is a period during which the implants remain in the bone and ‘rest’, which is followed by the phase of manufacturing the prosthetic solution. That’s all for this introductory article on the topic of dental implants. If you have any questions or wish to make a first appointment at our clinic, feel free to contact us.